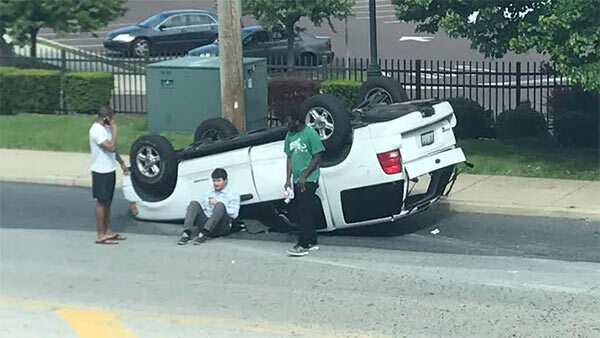 WYNNEFIELD HEIGHTS (WPVI) -- An SUV flipped over onto its roof after a crash in the Wynnefield Heights section of Philadelphia. The crash happened shortly after 4 p.m. on Monument Road near City Avenue, and right outside the 6abc studios. A white SUV could be seen on its roof, while a car with front-end damage was stopped nearby. One man crawled out of the SUV through a window and could be seen sitting outside the vehicle. There were no immediate specifics on any injuries.